You do have a wonderful garden. I'm not sure mine would agree with this logic - I do though. A great garden. It looks very lush and green. Have you had lots of rain?? Yes Paul, we've gotten more rain this year than any year I've seen since I started gardening 15 years ago, and I'm really getting spoiled by it too, no waterhoses to contend with....,hurray for that...!!! I'm so jealous Paul...., it sounds like a dream job ;-). 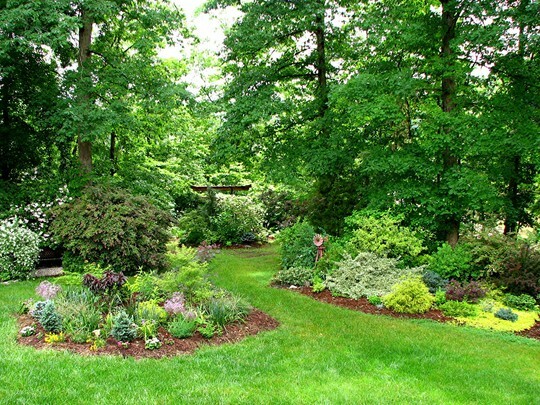 You must have a huge garden, it looks peaceful & gorgeous. I feel like you, my garden is my escape. The world can close in & all I do is go out & be in my garden & peace is around you. Really nice garden. Way bigger than mine. I know, it keeps my feet on the ground, no joke, it grounds me like nothing else. I get up in the morning, take a walk around, check all my lovelies. then I can face this gorgeous old world again. if anything goes astray with one of them I stress & assist, & before U know they respond. Really your garden I can see is just so healthy, happy & fab. it's great! it just gets better and better. Like the new bed...won't be long til you won't have any grassy spaces left! That's my plan anyway...hehehe..., just don't tell my husband...! Thanks for the wonderful compliment Janey ! That means alot to me. Oh most definitely....I've been feeling poorly with my back the last three days...started in to re-shingle the roof of my garden shed...and my back has been giving me grief since...so protect your back...and tell Roger than it will protect his back in the future...less lawn to mow! Sure hope you are on the mend Lori. We just don't realize how much we take our backs for granted until it starts hurting ! Have you tryed the new pain patch called Fletctor Patch (diclofenac epolamine topical patch). You'll have to get a doctor's prescription to get them. My sister-in-law says they're the best thing on the market. That really works well too if your stomach can stand to take 800mg at a time so that the medicine can also help shrink the swelling of the muscles, while it's helping block the pain. My husband takes an 800 mg ibuprofen every morning so that his back and knee will last throughout the day. Such a stunning garden, looks like a little bit of heaven. Thanks Susie, glad you like it . I'm afraid it's not fairing as well this year with record high temps this year. Thanks Pip c !. This year we don't have green like that either. We've been hit with record high temps and drought this summer. Glad I have this photo to remember how my garden can look when the conditions are more suitable...:-). Great to hear from you Dawnsaunt ! I hope all is well across the pond. I hope you have had a wonderful gardening season so far this year. I've been doing alot of remodeling to the house this year, and I'm beginning to think I'm crazy for taking on so many projects at one time...lol. I hope I live through it all so I can actually sit back and enjoy the fruits of my labor....;-). Hi Flc, you sound a busy girl. We drift from house projects to garden projects, keeps us all fit I guess. I'm sure it will be well worth it in the end.